Hey there Fantasy Strike fans! My name is Richard "Leontes" Lopez, the Marketing and Community Manager at Sirlin Games. Last weekend we attended Sony's PlayStation Experience and had a great time showing off our game to the thousands of fans who attended the event! We've done several shows in the past, all with the aim of spreading the good word of fighting games to the general populace. 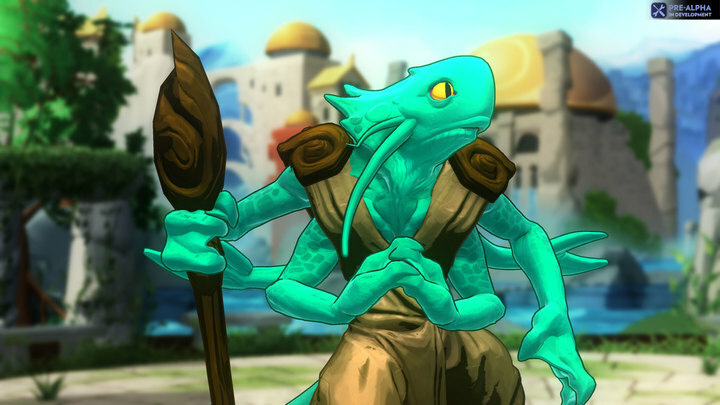 Notably, this was the first time we showed off our final launch character, Argagarg Garg, the Water Shaman! If you're a fan of Yomi, Puzzle Strike, Flash Duel or Codex, you're already familiar with this patient fish's signature fighting style. As the iconic "Defense" character in all of our games, he's a Zoner who is even more about keeping the opponent away than the others. He isn't in the Early Access game just yet, but keep an eye out for more information about him coming soon! We also showed off a brand new stage, Wall of Truth. It's Valerie's stage, with a magical painted mural detailing the history of the region and the tyranny of Flagstone. We'll hopefully be unveiling that one soon, too. Sirlin and Aphotix in heated conflict! Sirlin had many interviews this weekend! As usual, we received overwhelmingly positive feedback on Fantasy Strike. Since PlayStation Experience shared the weekend with Street Fighter V's Capcom Cup, there were a lot of fighting game fans in the crowd. We're continually stunned at how fast veterans of fighting games can pick up the game and have fun within their first match, how some of them immediately jump into training mode and start labbing it up, or how they challenge us to see if they can handle the devs at their own game. It's always a fantastic experience demoing for these types of players, and as we've seen at other fighting game events we've been to (EVO, NorCal Regionals, SoCal Regionals), there is a deep interest in our game from the FGC. But even more awesome (and more in line with our overall goals for the game) is how frequently Fantasy Strike is a hit with the non-fighting game crowd. At shows like Penny Arcade Expo and Youmacon, gamers of all backgrounds have the same sorts of experiences as those fighting game fans do; they learn fast, do amazing things and have hype matches with their friends. They're usually players who have always wanted to check out the genre, but have always been hobbled by complicated mechanics and its massive time investment. We get that. We're lovers of fighting games, too (that's why we're making one)! I'd be lying if I said I wasn't keeping up with Capcom Cup all weekend. 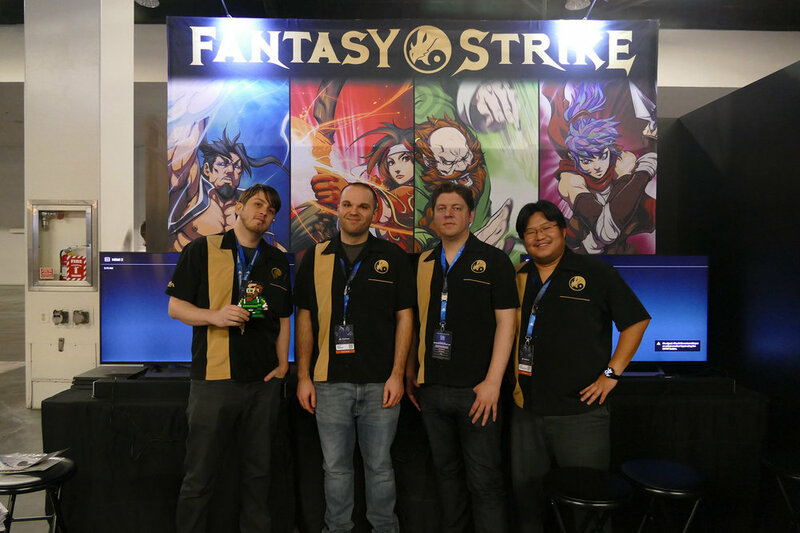 Our goal with Fantasy Strike has always been to make a game that is accessible enough to get newcomers into the genre but still maintain the same depth that long-time veterans like Sirlin want in their fighting games. We feel like we're really nailing that. We've come a long way since we announced and showed the game at last year's PlayStation Experience show. Since then, we've massively increased the production values of the game: new animations, sound effects, visual effects, shading and lighting styles. We've also added lots of new content since then, including over double the number of stages and three new characters. While we were setting up for this year's show, we looked at this year's and last year's versions of our game side-by-side and it was just incredible how far we have come. Looking forward, support us on Steam Early Access if you can, and we'll keep on improving. If you're waiting for the PS4 version, we're still several months away from that so keep an eye out more information, and thanks for already being a fan. Happy holidays everyone! Onward to PAX South! Older PostCongratulations to the winners of our #PandasyStrike contest! Save 25% on Fantasy Strike, Yomi, and Puzzle Strike for the Steam Halloween Sale!